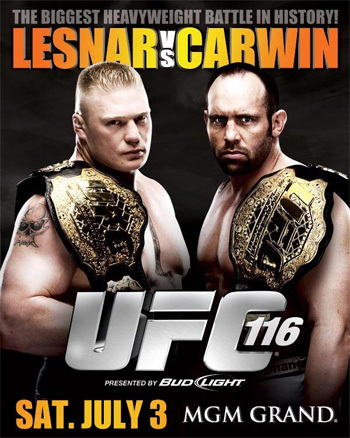 Spike TV announced today that they will continue their giving ways by offering a “UFC Prelims” special for “UFC 116: Lesnar vs. Carwin” on July 3rd. The edgy network confirmed that the lead-in show will feature an exciting middleweight tussle between Goran Reljic and Kendall Grove, as well as the heavyweight scrap involving Chris Tuchscherer and fast-rising Brendan Schaub. UFC 116 takes place inside the MGM Grand Garden Arena in Las Vegas, Nevada. The freebie special airs at 9PM ET/6PM PT and will serve as a teaser to the night’s pay-per-view broadcast.